Muddy Tools: Remove all dirt and mud from your gardening tools by hosing them off with a high-powered garden hose. If excess dirt remains, you can use a putty knife to scrape off extra dirt. Rusty Tools: Tools seem to get rust over the years, but we can fight back against rust by scrubbing them with steel wool. Sticky Tools: Place a small amount of mayonnaise on a white cloth to remove sap and goo from your tools. Exposed Tools: Sometimes, plants get sick with fungal or bacterial diseases. It is important that you do not transfer this disease to any other plant. Clean your tools with a bleach-free disinfectant wipe to ensure sanitation. Soaking Bucket: After you have removed any dirt, rust or goo from your tools, place them in a bucket with hot water and dish soap. Let the tools sit for about ten minutes before removing them from the soaking bucket. Take out the tools then rinse them off with warm water. You will need to dry your tools with an old rag to prevent future rust. Cleaning Bin: Instead of waiting to clean your tools, you can create a quick cleaning bin by combining a medium size bag of sand with one cup of vegetable oil. After you use your tools, place them in the sand bucket and let them sit overnight. The sand bucket will help any mud or dirt come loose from your tools and make any future cleaning easier on you. Now you never have to neglect any of your gardening tools again with these easy tips. Do you have any tool cleaning tricks up your sleeve? 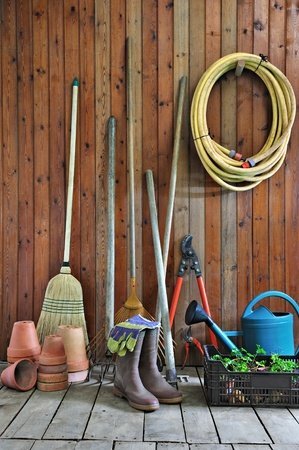 We would love to hear about how you keep your garden tools and supplies clean in the comment section below.